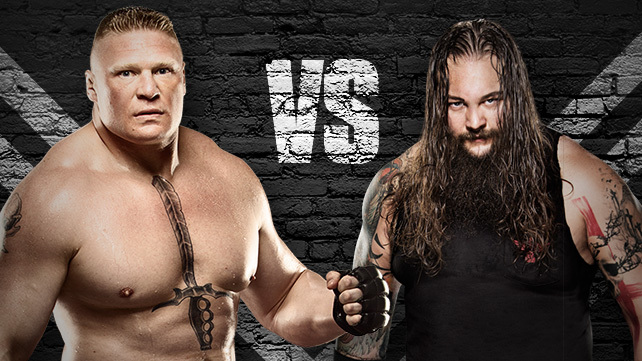 Bray Wyatt vs. Brock Lesnar. A feud we have never seen before surely that must interest people. I definitely know it interests me! Could this be the money feud that Wyatt needs? Let’s take a look at the feud so far. On the January 4th Raw the Wyatt’s attacked Big Show & Ryback leaving people thinking they just attacked them to send a message to the Rumble participants. On the January 11th Raw The Wyatt Family took on the Social Outcasts which lead a lot of people to think that the Wyatt’s were sending the simple message of “look out” to the rest of the WWE roster concerning the Royal Rumble. Ryback caused the Wyatt’s to win via DQ and believe it or not with the help of the Social Outcasts sent the Wyatt’s in retreat (at this point we are thinking that someone backstage must not like Bray Wyatt & The Wyatt Family AT ALL to give him another meaningless feud with Ryback the last time they tried a Wyatt/Ryback feud around May of 2015, Wyatt defeated Ryback at Payback on May 17th 2015 and shortly after that the feud was dropped in favour of a Reigns/Wyatt feud that began the following month). The closing moments of the Jan 11th 2016 Raw saw Lesnar make his statement. Roman Reigns is taking on fourteen other men in what is called a “One vs. All” match, Reigns is beat down by the heels and that’s when the music strikes the familiar start of Lesnar’s music and when that hits you know what is going down. Lesnar attacks everyone including Reigns at this point we are thinking Brock/Reigns 2 at Wrestle Mania 32 in Dallas Texas on April 3rd 2016. Fast forward to the January 18th Raw we are at the end of the show it’s Jericho’s highlight reel and god himself Paul Heyman explains that the Royal Rumble will be Suplex City courtesy of Lesnar who makes an appearance but so does Reigns and of course they go at it. Wyatt’s familiar three second video package pops up and they are indeed here surrounding Reigns & Lesnar. Reigns is all too familiar with this he attempts to fight them off but the Wyatt’s lay him out, Lesnar makes it to his feet “Get Him” Wyatt orders his family to attack the Beast and they do. Wyatt himself then lays the Beast out with Sister Abigail, message sent loud and clear. On the Jan 21st Smackdown the Wyatt’s once again lay out Reigns and send the clear message Reigns needs to watch out for them in the rumble. Royal Rumble time the 24th of January 2016 and the Wyatt family have eliminated the likes of Stardust, Neville, Kane, The Big Show & Mark Henry. #23 hits and Lesnar makes his way to the ring he heard the Wyatt’s message and didn’t like it at all. The Beast wrecks everyone in the rumble and eliminates Harper, Rowan and impressively Strowman. #27 hits and its Wyatt, him and Lesnar are bound to go at it but before Lesnar can blink the family are back and they are on him like a pack of dogs and before he knows it at 8 mins and 13 seconds his time in the rumble is up thanks to the Wyatt’s. Unusually though the following Raw (Jan 25th) Wyatt looks weak against Kane despite getting the win and standing tall and has nothing to say about Lesnar. Things change a slight bit at the end of the show as Mrs HHH announces that the winner of the Fastlane main event will take on new WWE World Heavyweight Champion HHH at WM 32 the people in that main event are Roman Reigns, Dean Ambrose & BRRRRROOOOCCCK LESSSSSNARRRR. My guess is at Fastlane the Wyatt’s cost Lesnar his chance at the title and one of three things can happen. Lesnar vs. Strowman, Lesnar vs. Bray Wyatt OR long shot but Lesnar & Undertaker vs. Strowman & Bray Wyatt. There has been short interaction with the Wyatt’s & Lesnar so far but it’s been very interesting this is a feud worth watching. A feud I think will finally give Wyatt that much needed big feud win he needs. A feud I think we all need to see we just never knew it.